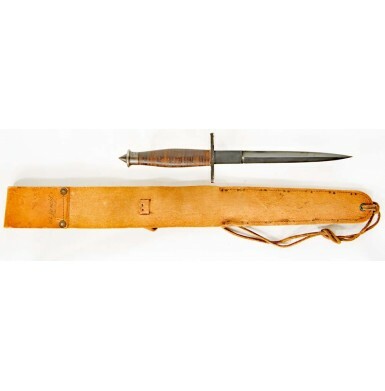 This is an EXCELLENT condition example of the very scarce V-42 Stiletto, which was developed for issue to the First Special Service Force (aka “The Devil’s Brigade”) during WWII. The First Special Service Force was the predecessor to what would be known as the Army Special Forces. In fact, the V-42 is immortalized as the centerpiece of the logo of the current Army Special Forces (The Green Berets) today. The V-42 was officially designated, via the Quartermaster Department order as “Knives, Fighting Commando Type V-42”. According to US Government procurement and receiving reports, a total of 3,420 of the knives were purchased during World War II, not counting the 3 sample knives submitted by Case during the initial testing phase. The deliveries appear to have taken place between late 1942 and November of 1943. The V-42 knife was produced by the famous W.R. Case company of Bradford, PA. The W.R. Case company was started in 1889 by the Case Brothers: William Russell (WR), Jean, John and Andrew. Initially they sold knives as traveling salesmen, working the wagon roads of upstate New York, with their home base being Little Valley. The Case brothers had learned the knife making and retailing business while working for the Cattaraugus Cutlery Company. In 1905, John Russell Case, son of W.R. Case, moved the company to Bradford, PA and established it as W.R. Case & Sons. The company grew to become one of the foremost American knife making companies over the next few decades. During World War II, Case manufactured thousands of fighting knives and edged weapons for the US military including the M-3 Trench Knife, producing some 300,465 of those knives during the war. They also produced the USAAF Survival Machete and the V-42 Stiletto, which Case claimed to have produced more than 3,600 of during the war (See Cole), a number that slightly exceeds known US government purchasing records. The Case company remains in business in Bradford today, as a subsidiary of the Zippo Lighter Company. The V-42 Stiletto was developed by Colonel Robert T. Frederick, who was to command the new First Special Service Force, an all-volunteer join commando force utilizing both American and Canadian troops. The design of the knife was influenced by the close combat instructor for the battalion, Michael “Pat” O’Neill, who had served as a sergeant with the Shanghai Municipal Police under the legendary close combat instructors Fairbairn and Sykes. In fact, the basic contour of the V-42 closely resembled that of the famous Fairbairn Sykes fighting knife. Colonel Frederick selected the sample knife submitted by Case, over examples provided by Camillus and Cattaraugus as well. The official specifications for the knife called a 7 5/16” stiletto style blade, although the handmade knives tended to vary in length very slightly by about 1/16” of an in, with 7 ““ being fairly common. The hilt has a palm swell and was made of thin leather washers, stacked and compressed. A small steel crossguard separated the ricasso from the hilt. The obverse ricasso had a thumbprint sized serrated imprint, which was intended to allow the soldier to correctly orient the knife by feel and allowed the thumb to index and support the knife when stabbing an opponent. As the knives were hand made by Case, the size and number of the serrations in the thumbprint is known to vary from knife to knife. Below the thumbprint serrations, the name CASE was stamped on the ricasso. A pointed pommel cap was included at the rear of the hilt, which was intended for use as a “skull crusher” in close combat. The pommel cap was secured to the hilt of the knife by a single transverse pin. 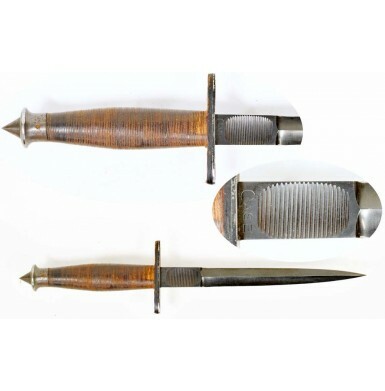 The blade and the pommel caps were deeply blued to protect the metal of the knife and to minimize reflection from the metal. 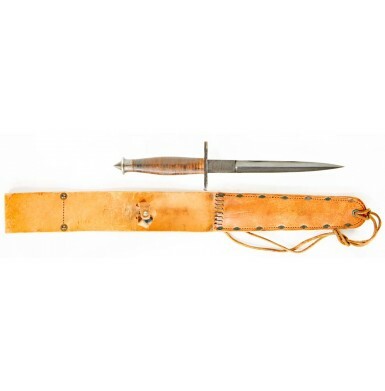 The knives were issued in leather scabbards that were similar to those issued with the Camillus USMC Raider Stiletto and would eventually be used with the M-3 Trench Knife. 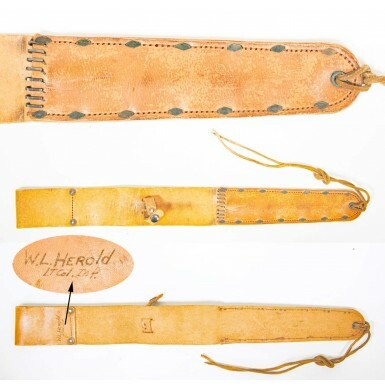 The scabbard was leather and was assembled by stitching and riveting the body together. 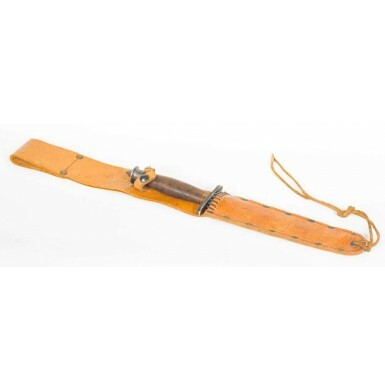 The scabbards were very long, as the original mission for the First Special Service Force was thought to be as mountain troops operating in the snow-covered regions behind German lines. The long scabbard allowed the knife to be reached easily, even when the soldier was wearing a parka. As the First Special Service Force, was sent to the Aleutian Islands in 1943, the long scabbard was probably appreciated. The First Special Service Force saw additional service in Italy, Anzio, and France before they were disbanded in 1944. 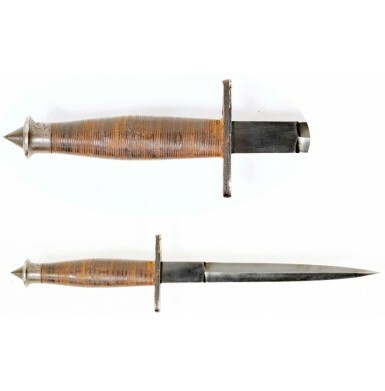 The initial lot of 1,750 of the knives were delivered to the First Special Service Force in November of 1942. An additional 70 knives were delivered to the Brooklyn Navy Yard in February of 1943. These were the only knives not delivered to the First Special Service Force and are the knives that appear to have been issued to the landing crew of the Light Cruiser OMAHA. The balance of the V-42 stilettos were delivered during 1943, with 600 arriving in June, 100 in October and the last 900 being delivered in November. This V-42 First Special Service Force Stiletto is in about FINE overall condition. The knife is 100% original and correct and retains its original long leather scabbard. The knife blade measures 7 3/8” in length, which is about 1/16” longer than the regulation length. While it was not uncommon for many of the knives that saw actual use in the field to be re-tipped making them a little short, rarely do you find a knife is full-length or slightly longer! The re-tipping was due to both breakage, and the fact that the needle like knife tip was so sharp that it was often dangerous to the man who carried it. The blade retains about 90%+ of its original blued finish, with the loss primarily along the edges and contact points. The blade is almost entirely smooth, with only some light surface oxidation on the serrated thumbprint indentation at the ricasso. This “thumb print” is in fine condition with 21 neatly cut grooves, which remain extremely crisp and show only minimal wear. The leather washer grip is in VERY FINE condition with only lightly scattered handling marks and some minor scuffing present. There are no gashes or cuts present in the leather. Even the original leather lining is present on the rear of the cross guard, something that is nearly always missing from these knives. The skull crushing pommel cap is in FINE condition as well. It remains very sharp and pointed and would be quite effective even today. The pommel cap retains traces of its original blued finish, which has faded and blended with a smooth, plum brown patina with some minor flecks of surface oxidation. The pommel cap remains securely attached by the single transverse pin that passes through the hilt of the knife. The knife is accompanied by its original scabbard which is in VERY FINE condition as well and shows very little wear. The scabbard remains full-length, with the leather remaining in strong pliable condition, and the scabbard remaining fully functional. The scabbard retains its eight original “staples’ (actually conveyor belt joiners) at the throat to keep the knife from cutting the scabbard. The fourteen original semi-diamond shaped rivets remain in the scabbard body as well. Both the staples and the rivets retain much of their blued finish with some loss and surface oxidation present. The original hilt-retaining strap is in place on the scabbard as well and is complete with a functional snap. The rear of the belt loop of the scabbard has the name W.L. HEROld written on it, over LT Col. Inf. Interestingly Lt. Colonel Herold was a “HERO” receiving the Silver Star and a Purple Heart, dying of wounds that he sustained in combat in France during WWII. Lt. Col. Herold was born November 13, 1912 in Sutton, WV. A determined, competitive and hard-working student, his persistence in pursuit of a West Point appointment resulted in receiving one from Representative Joseph Smith of West Virginia’s 6th Congressional District. After graduation, Herold’s first post was Fort Moultrie, SC. Subsequent postings included a posting in the Panama Canal Zone and eventually a transfer to the Fort Benning, GA where participated in the Student Tank Course at the Infantry School. He was then sent to Fort Meade, MD where he joined the newly formed Tank Destroyer Battalion. His battalion was then transferred to Fort Hood for further training and during this time the newly minted Major authored the tactical portion of the FM 18-5 Tank Destroyer Manual. In November 1942 he was promoted to Lt. Colonel and was given command of the 610th Tank Destroyer Battalion. After further training his command was chosen to be converted to battalion of towed 3” artillery pieces. It was serving in this capacity that the battalion was transferred on June 1, 1944 to Scotland, from which they prepared for their crossing of the English Channel, landing on Utah Beach on July 31, 1944. The battalion joined the 80th Division and pushed into France. The battalion was supporting the 80th Division dealing with German resistance in the Argentan-Falasie Pocket when the battalion’s advance was stopped by a stream east of Argentan on August 19, 1944. Taking the lead as he always did, Lt. Col. Herold was organizing the establishment of a ford to cross the battalion when his advanced exposed position came under German artillery fire. The resulting hits wounded all five men in this advanced position, and Lt. Colonel Herold died the following day. For his heroic actions and leadership, he received both a Purple Heart and Silver Star. Lt. Col. Herold is buried at Arlington National Cemetery and information regarding his service is included with this knife. 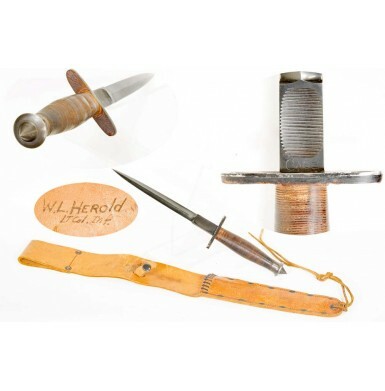 The knife was purchased from the son-in-law of one Lt. Col. Herold’s friend, Colonel Russell T. Jones. 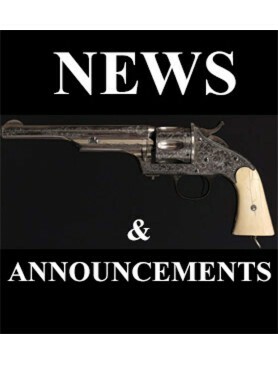 How Colonel Jones obtained the knife is not clear, but prior to it being offered for sale, it had been in his foot locker since the end of the war. Overall this is a wonderful identified, World War II issue V-42 First Special Service Force Stiletto. With only 3,420 of these knives produced, these knives are very rare today and are not often found on the collector market for sale. Official records indicate that Camillus produced 14,370 of the incredibly scarce USMC Raider Stiletto during World War II. With only 3,420 V-42s produced, they are about 4 times rarer than the coveted Raider Stiletto. As such, they ought to command prices about 4 times higher! This knife is 100% original and correct in every way with a wonderful period identification written on the original scabbard, which remains in wonderful condition. These knives rarely appear on the market for sale, particularly in this level of preservation. When they do, they are often priced at the $7,000+ price point. If some auction house “prices realized” publications can be believed, knives in this condition are selling for $10,000+ in some situations! This knife is prices nowhere near that level, is almost impossible to upgrade and is one you will never have to make and excuse for. This would be an outstanding addition to your WWII edged weapons collection and is certainly worthy of being a centerpiece in even the most advanced military knife collection.